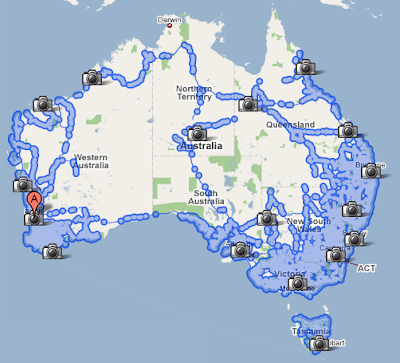 Google Maps StreetView is now available for Most of Australia and Japan! The quality of the images is impressive and the coverage for Australia is stupidly comprehensive with all major cities are most populated rural areas covered, as indicated by the blue patches in the image below. Hi, I'm Bob. This google map is very much helpful for me because within six days I'm going to australia, I'm new for australia from the help of google I can identify the streets and city details very easily. Thanks to google. Street View, Google's useful/controversial feature with drive-by photography of streets in major cities, is now live in Australia after several months of (presumably) tedious filming. Look for an address in Google Maps and if the area has been recorded, click on the Street View button for a panorama of where you're trying to get to, or where you live -- this is the new ego search). Google has used reportedly blurring technology to ensure faces aren't visible, though we haven't encountered any examples yet. But despite the honks from privacy advocates, this is a very useful feature when you're trying to find an unfamiliar location -- visual cues can really help. Great. Thanks for sharing this.